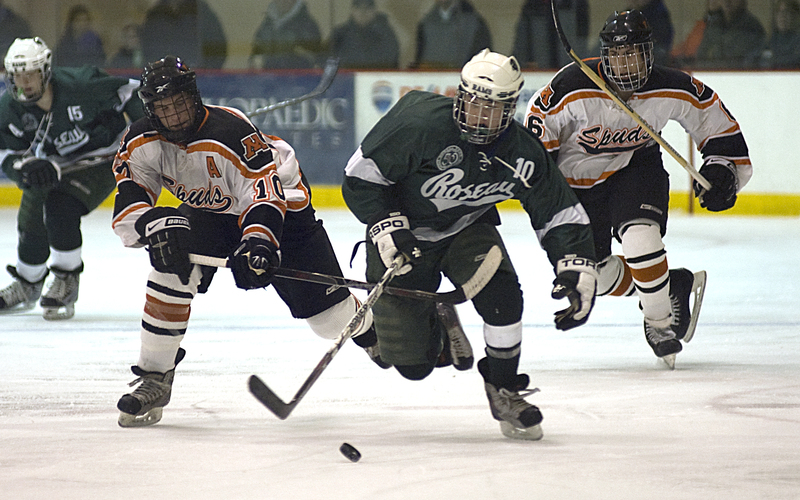 Roseau grabs early edge in Section 8AA race. 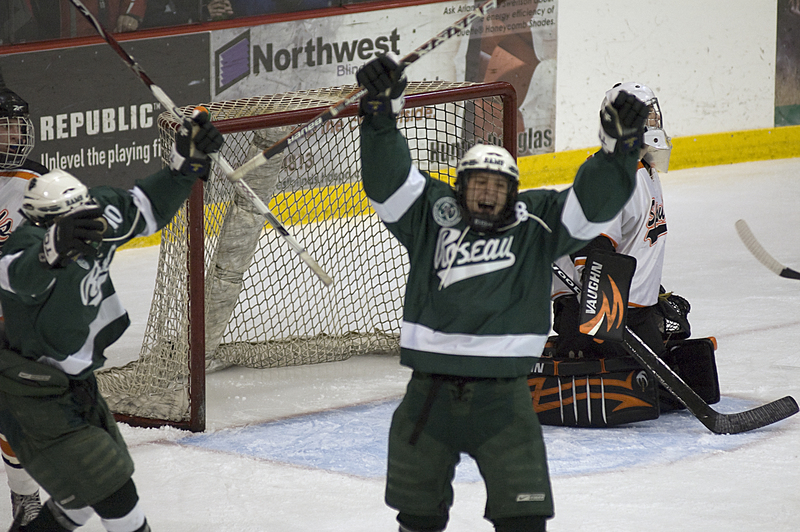 Last winter, Moorhead had Roseau’s number on the hockey rink. The Rams played Moorhead three times and suffered three defeats, including a 5-2 loss in the Section 8AA finals that ended their season. But in the first meeting between the two Mariucci Conference powerhouses on a frigid Tuesday night at the Moorhead Sports Center, the Rams got their revenge. 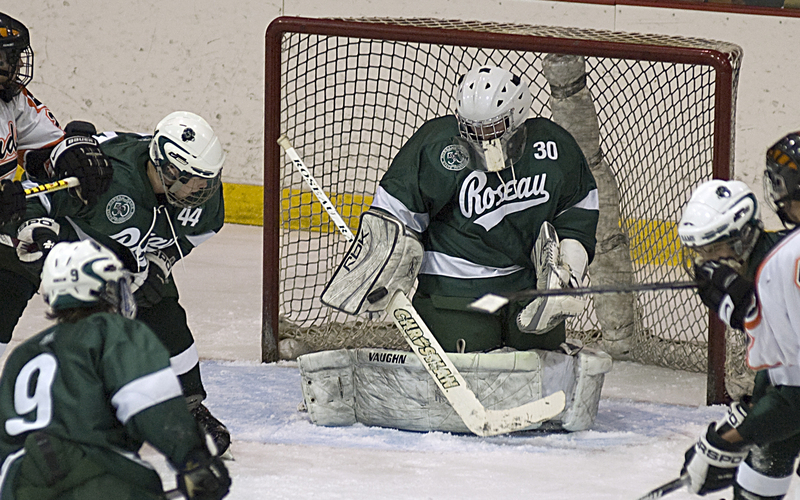 Buoyed by 33 saves from senior goaltender Ethan Kvidt, Roseau beat the Spuds on their home ice, 4-1. 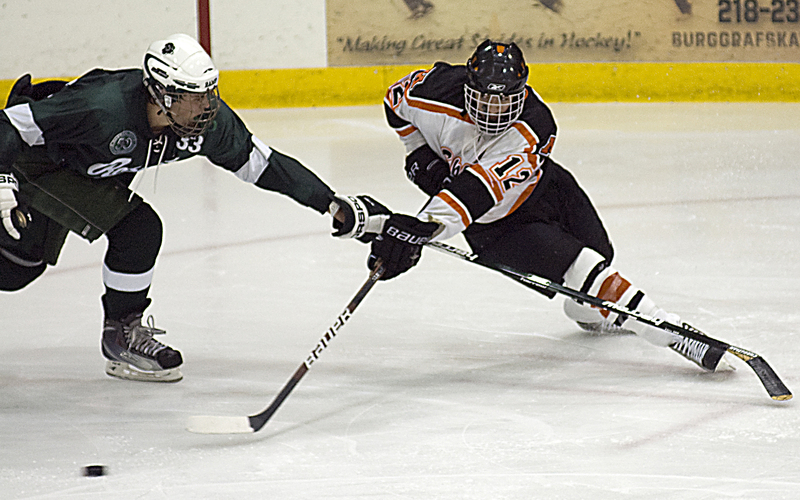 What they had was a standout effort from Kvidt, who allowed nine goals in two losses to Moorhead last winter. Kvidt (5-1-0, 2.51) was at his best over much of the first two periods, when the two teams were locked in a scoreless duel. After senior forward Kevin Erickson finally opened the scoring at the 13:40 mark of the second period, Kvidt withstood a furious Moorhead rally over the final three minutes of the period to retain a 1-0 lead into the second intermission. 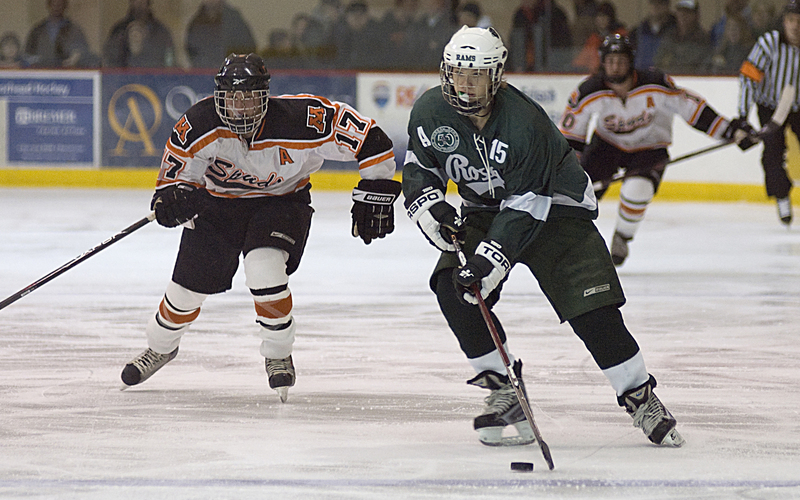 The Spuds hammered away at Kvidt while on the power play in those final minutes, including several point-blank shots from goal-scoring leader Kyle Kraemer. But Kvidt stood tall. The Spuds seemed deflated when the third period began, giving up goals just over a minute apart to Roseau’s Cole Kostrzewski and Mike Johnson to push the lead to 3-0. Rams’ defenseman Tim Tesarek stretched it to 4-0 midway through the third, at which point the only suspense was whether Kvidt would get the shutout. Brandon MacLeod finally got the Spuds on the board on the power play at 14:08. Moorhead threatened to cut the lead further in the final minutes, but could not solve Kvidt again. Moorhead outshot the Rams 34-29. 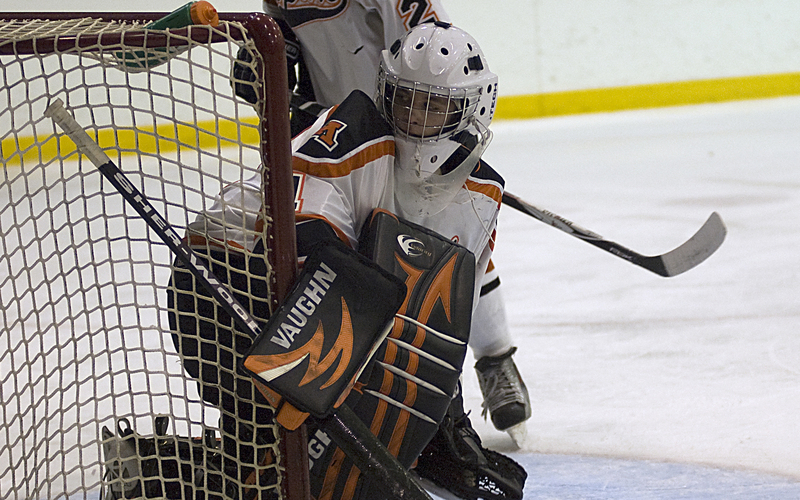 Spuds’ goalie Logan Marks made 25 saves, but was screened on several of the goals, including a “ping pong ball” opening goal by Erickson. After the game, both coaches reiterated that it’s still early in the season and there is plenty of hockey to be played before these two teams play again. But it certainly was easier for the Rams to put the game behind on the long bus ride home. The Roseau goaltender came up big when his team needed it most, making 33 saves to give the Rams a 4-1 victory at Moorhead. With Roseau clinging to a 1-0 lead late in the second period, he made several very difficult saves as Moorhead stormed the net but could not score. Kvidt's shutout bid was broken with under three minutes remaining. 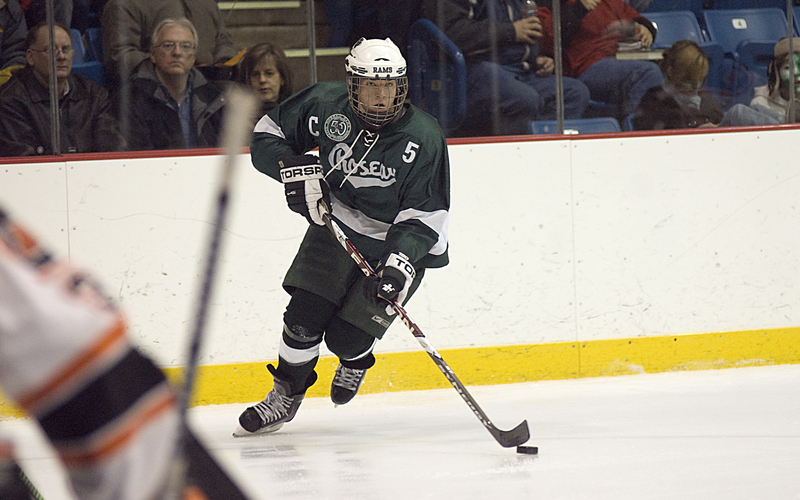 Tesarek played solid defense for Roseau in front of Kvidt and also factored into the scoring in a well-rounded game. He assisted on the first Rams' goal in the second period, then iced the game with a goal of his own midway through the third. Moorhead's goal-scoring leader had several chances to add to his total, but couldn't get one by Kvidt, particularly in the final minutes of the second period with the game still a one-goal affair. Still, his play around the net was impressive, if snake-bitten. 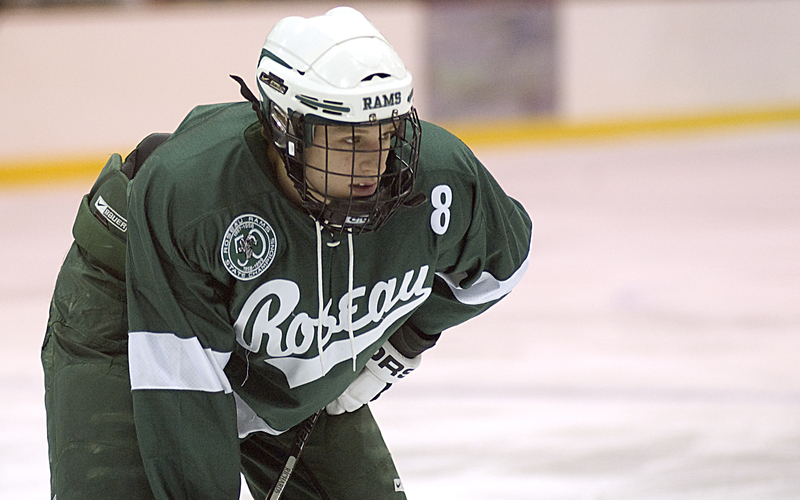 Heading into the game, Roseau senior forward Adam Knochenmus had scored three hat tricks in his previous three games. The Moorhead defense and goaltender Logan Marks kept Knochenmus out of the net Tuesday night, but he still leads the team in goals with 11 and is second to linemate Shane Omdahl in points. 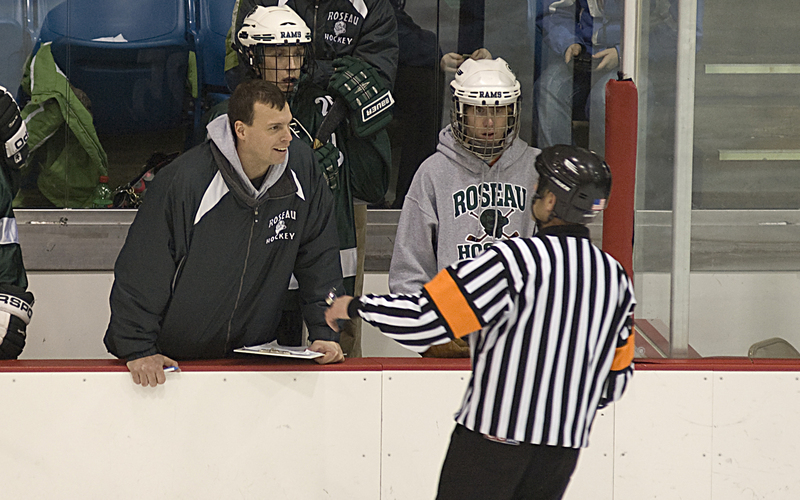 Roseau coach Andy Lundbohm attributed Knochenmus’ success to his nose for the net. “I don’t know if there is anybody in the state who goes to the net as hard as he does,” Lundbohm said after the game.